Tommy Bahama always has the brightest colors! Bring a touch of soothing tropical style to your bedroom with the Tommy Bahama Aregada Dock Sky 3-piece Quilt Set. This set features a soft cotton construction with a reversible quilt in a floral pattern in green and blue that you will be sure to love. For the price, I am really happy. Colors are bright and I like the apple green underside. The Quilt is thin but does have quilted stitching. I would still call it a bedspread. But highly recommend. The quilt set is true to size and color. The quilt washes and dries easily. I first washed with vinegar to set the colors. Looks great! I was encouraged by the reviews I read about the brightness of this quilt and I was not disappointed! The greens range from a lime/chartreuse to a kelly, the blue background is a vibrant "baby blue" and the flowers have touches of salmon/orange. The weight and size (we purchased the full/queen for our queen bed) is perfect and it arrived super fast. Another awesome deal from Overstock!! The Tommy Bahama Aregada Dock Sky 3 piece Quilt Set would have been great had the greens fallen into the correct hues. I have a set of Tommy Bahama pillows and thought the quilt was going to match; but, unfortunately it did not match and had to send back. I do agree with comments that they would have used the description of “bedspread” instead of quilt. The Tommy Bahama quilt was nice enough and a good purchase for the price. The only reason for 4 star instead of 5 is I purchased a king quilt and didn't know it would not be quite wide enough to use as a comforter. Too narrow on the sides, needed about 18 " more width. However, the happy ending is that it was perfect for our queen size guest bed. Since it came with king pillow shams, they looked a little wide for the queen bed, but you could put standard size pillows in and just tuck the ends in like I did. Gorgeous color and excellent workmanship. I love it! Bought this for Florida. It has beautiful muted colors and is just the right weight. It has King pillow shams. The quilt is good quality and I really like the beachy feel of the print, but when I washed it in cold and dried on medium heat it shrank soo much it doesn't fit the bed anymore. If you're getting the queen for a full size bed it will be fine, but I honestly can't recommend it for a queen as it is now at least 3 to 4 inches short on every side. Very disappointing and of course now I can't return it. It wasn't as substantial as I thought, but it's perfect for the hot Florida weather. The colors are vibrant and nice. Note that the backing is a bright green. This is poor quality. Quilt is quite thin. 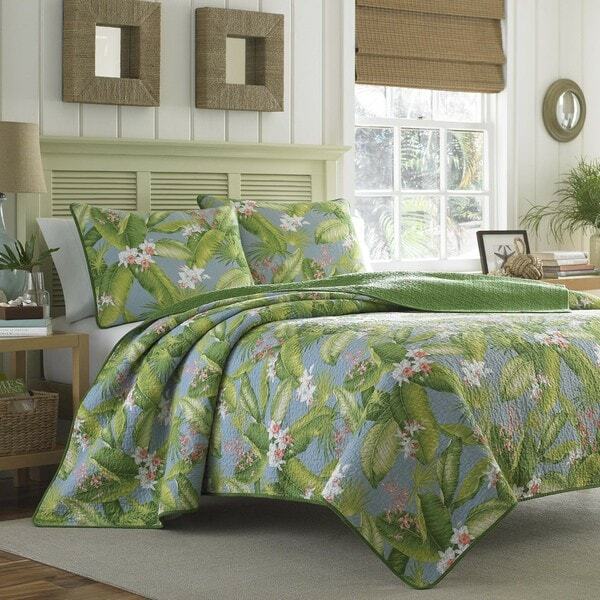 This quilt set is absolutely lovely it makes me feel like I am back in Hawaii. Best decision I made..
Just the colors we were looking for and large enough for our sleigh bed to not need skirt. I was looking for something tropical and this is perfect. Be careful when you wash it because it does shrink just a little. Tommy Bahamas quality, pricing & fast delivery. I love it. The vibrant colors make my tropical bedroom awesome. This Quilt set did not make me happy. I use the quilt as a blanket but would not use it where it would be seen on the bed. It was very faded and the shams were very small. They shrunk more in the laundry. They are useless. I can not recommend this set. Back of quilt was cheap material. The picture of the spread was just what I was looking for. When it came, the colors were almost neon! I returned it immediately, I would not recommend this spread to a friend, unless you are looking for VERY bold colors. using this set in my tropical guest house. looks great and washes well. For a Tommy Bahama set, this is a great price, however, the flip side of the product is a dull green, and you can see the stitching, which seems to be of a nylon type thread, which can be scratchy. After a while, this has just gotten duller to me. "Is the background color grey? Like a bluish gray?" Its more blue, kinda like a darkish sky blue. I don't think it's very grey at all. I would call it a blue with gray undertones---- if you look at Pier 1's pillows for the "Maui", it's about that color. This is a really nice quilt! "Is there any window and shower curtains to match?" "does this include a bed skirt?" This item does not come with a bed skirt. Just Sham(s). No, it does not include a bed skirt. "how can I cancel this order"
Hello rickie, I apologize for the inconvenience but currently the king size quilt set is sold out. Items are restocked as they become available; however, we cannot guarantee an item will be restocked. Thank you for shopping with us. I like the color of green and it is shard to find. I liked the pattern as well. All matches my bedroom and bath green color. I love tommy bahama quilts and the colors are bright!